Vila "I thought you said we were only going to be stuck in this caption until new years Avon !" Avon "I`m just contacting them now Vila"
Villa: Look at him. I'll bet he's dreaming of a white christmas. I'll give him a white christmas. I'm going to dump a glass of milk on his head then I'm going to strangle him with this garland....tonight you die Avon! Avon: "...and of coursh I was verr', verr' dhrunk..."
Avon: "Is that a mustard stain on my sleave?" Avon and Vila are annoyed because of their six hour wait for Tarrant outside Rebel-Haircare. I can never get them damned mothballs out of my uniform! Vila: " That was one hell of a party last night. You should see what Blake did to Og's wife!!! " Avon: " OH REALLY!!! " Vila: " Tinsel wigs??? " Avon: " Yes Tinsel wigs. It'll save us a fortune from all these perms we've been having. " Vila: " Let me get this straight. We are fixing a trap for the federation. They've all been sent party invites. Upon entering the door. We pull this tinsel tight making them trip over. " Avon: " Yes that's right. ITS PURE GENIUS I TELL YA! THEY'LL NEVER EXPECT IT! SERVALAN AND GUARDS WILL COME RUNNING IN AND BREAK THEIR NECKS. ITS JUST SO DASTARDLY CLEVER OF ME!!! " Vila: " Avon?.......... You been drinking that high Octane punch again? " Vila: " That was one hell of a party last night. You should see what Blake did with Og!!! " Vila: " Um Avon that Tinsel G String looks disgusting!!! " Kyzka " I See Martin hasnt progressed from his kill im captions..... KILL IM!!! " Avon: ..2...3...4...5....6....10, comming ready or not! Yet again Avon rolls up his sleeves and prepares to teach Vila a lesson, NOT to mess with his newly made Blue Peter Advent Crown. Avon: 5, 4, 3, 2, 1, Happy new year Vila! Vila: Avon, I think I've found one of your eyes in this tree. yo villa,i need some more water,ma bongs run dry . Vila: Hey! It's someone sneezing at my Christmas decorations! Kill 'im!! Avon: Cally, teleport us up quickly - we've arrived on a planet where even the Christmas decorations look fake. Vila wasn't entirely convinced that the director's idea of doing a panto style xmas special, was keeping within the context of the show. Avon: Well now, Vila, we'd better tidy up fast if we're hoping to persuade Blake we DIDN'T throw a series of parties while he was out fighting the Federation. Avon: Well now Vila, a new teleport bracelet and handgun set for Christmas, you shouldn't have. You did remember the batteries didn't you? Vila: Avon, if you're going to sneeze would you mind pointing your gun the other way? I have this alergy to being shot you see. Villa to Avon : You look like you've had enough partying, too much of MY soma was it. Vila: I hope you haven't given me a lockpick again this year, Avon. Bit like coals to Newcastle, really. Avon: Well now, Vila, and I bet you've stolen me the usual Imperial Leather aftershave, haven't you? Vila "D`ya think this will look good wrapped around the main blaster Avon?" Avon.......I`m going away for Christmas next year !!! Villa thought a little sleek low cut number would get Avon's attention. Vila: why do I always have to visit the BBC props department to get the bits for the next alien? vila had found the christmas presents amongst the tinsel, and looked on at avon in disgust as he discovered that avon had got him SOCKS! for christmas. and they weren't even humorous he thought. vila was hoping for avon to give him a hand in purchasing the christmas decorations for the liberator, but avon was too busy trying out shades of lipstick on his hand to see which one would suit him best. AVON: EXTERMINATE! EXTERMINATE! 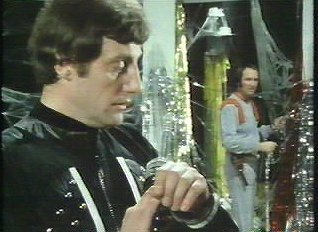 VILA: NO AVON THIS IS BLAKES 7, NOT DOCTOR WHO. NOW TAKE THAT DALEK GUN BACK TO THE PROPS DEPARTMENT,AND GET ME THE TREE LIGHTS. Vila was decidedly unimpressed with Woolworth's tinsel stock this Christmas. However, Avon was having fun in the Aftershave/Perfume department! Vila- avon! How could you? Avon to bracelet- bring me up Blake. he's just found the remains of Rudolph, and i don't think he'll believe my story of the bulb in his nose busting, causing him not being able to see, and as a result him smashing into the liberator, do you? vila looked in disgust at avons colour scheme for the christmas decorations on the liberator. they were SO last year he thought. Vila: That was a good party. Help me take down these decorations. Avon: Vila, it's gone 3am, it can wait until morning. vila- isn't this a nice christmas tree Avon? Vila- Avon, santa does exist doesn't he? Vila- it's just that i've found a santa suit suspiciously your size, and last year instead of saying ho ho ho i'm sure i heard the words 'well now' muttered somewhere. Vila- oh my god! it's you isn't it? Avon- no of course not! Well, alright then. but don't tell anyone! vila- come on then, what have you got eveyone for christmas? vila- whose is this santa costume hidden amongst the tinsel? Avon- it's santas. i saw him running naked along the corridor yelling 'i'm on strike'. queer chap. Vila (suspiciously) avon, why is there a santa costume here? You're...you're not santa clause are you? really? Avon to himself- maybe if i humour him long enough he'll get bored and shut up. Avon to vila- yes vila. i'm santa. ho ho ho and all that. Vila: Hey Avon, can I have some help with the Christmass decorations? I've been puting them up all day and everyone ran away! Avon: Hmmm, what were you saying Vila? Well, whatever it was youll have to tell me all about it later. I need to get some sleep. Bye. Vila:(thinks to himself) What a jerk. Thats it, when Santa comes I'm shoving all his gifts in an airlock and getting him coal! Vila: I don't think Avon's too happy with the Christmas present I got him!! Avon, I don't really like your decorations. Well now Vila, you are just going to have to put up with them now aren't you? If you need me, I'm at a little club Vila has brought me to. Avon: Oh no... the glitter's gone up my... aaah - aaaaaaaaah - CHOOOOOO! VILA: Avon when is Santa coming? AVON: Soon Vila, soon. (into bracelet) Hurry, Blake! I know you're finding the beard difficult, but Vila's beginning to get suspicious! AVON: Vila, hold perfectly still. You have your foot on either a mine or an amusingly shaped dog crap. VILA: Oh, ####! I hope it's the mine. These boots are from Santa. Avon " Well have you finished organizing Vilas birthday party yet ? I can't keep him hear forever "
Vila: Got all the tinsel, Avon, but, um, where's the tree? Avon: Tarrant. We need a tree. Set a course for Gauda Prime. Vila " Avon, stop watching Servalans christmas speach to the Federation and help me dig out Orac !" " Eh, Cally... We appear to have teleported into Servalan`s bedroom. HELP ! " Vila hated the fact that he was always the one left to clear up the mess left at the annual rebles christmas bash. " well, you can`t expect someone of My station in life to help. " explained Avon " Besides, I might brake a nail or lose a stud. " Vila ( to himself ) " Come the revolution your going to be frist against the wall mate. " Avon: "Tarrent get help. Vila's stuck to the Christmas tree again"
Avon: "I told you not to put Vila in charge of the decorations, he's gotten tangled up in the tinsel again.."
To Avoid Getting Lumps Of Coal From Federation Santa For Being Very Bad Boys and Blowing Up Stuff Vila and Avon Attempt a scam. Avon: OK santa, give me what I want for Chrismas or the elf gets it. Vila in elf voice: He really means It!!! Avon (into teleport Braclet): Blake, looks like you're wrong again. This isn't a vital Federation munitions depository. Unless tinsle is an offensive weapon of some sort. Vila: So what are we getting everyone for christmas. Vila: What?? Do they sell those here? Vila "I thought you weren`t coming to my party"
Avon "I`m the wine waiter"
"About that aftershave you bought me Vila !!!" Vila: Oh God! role on january. Vila, What did you ask Father Christmas for Avon? Vila " Bit of a mess Avon"
Avon " Yes I don't think we'll use Daynas party poppers next time"
Vila: Um, Avon, isn't there meant to be a tree to put all this on? Avon: If I pretend to sleep long enough that fool Villa will get stuck triming the x-mas tree. Look at him stare at me, the fool, I know he's in love with me. Hey, after a couple of beers he just might look cute. One things for certan, he looks a hell of alot better than that tub-of-lard Blake. Villa looking at Avon & thinking to himself: Why do I have to trim the x-mas tree and that lazy son-of-a-window-dresser gets to take a nap. I'll fix him. I'll put his hand in a bucket of warm water and blame Blake. he he ha ha he he he!!!! I dont care what you say, that was not mistletoe. VILA: Avon, you drank all the whisky for Santa didn;t you? Avon closed his eye in horror as the recycled bean curry echoed around the room. Avon could feel a really big sneeze coming on and Vila hoped like hell he wouldn't blow all the tinsel away. Avon, (to himself), When they asked whether I`d come back after all these years for a Christmas special, I thought the plot would be a bit more exciting than this. Vila, Oh come on Avon, lighten up. Blake said that you can be the evil stepmother in the Liberator panto. Now please can you get out of the black and into your costume please? Avon, Shut up and clean the floor Cinders. Vila, Okay, just put this tinsel on then. Avon, Don`t expect any help from your fairy Godmother, Cinders, Servalan got the part. Vila: Avon, you big jessie, stop complaining about your broken finger nail and give me a hand! And a fir tree up her knickers! Avon: (to Liberator) You know I think he's getting worse. Vila: I've nearly finished the decorations Avon, just like you asked. I've even done the cobwebs you wanted. Avon: Well now, that makes it all worth while. Avon: "If this is Christmas... then why is there a large Cadbury's Easter Egg on the floor?" Vila: A new lockpick! Just what I always wanted. But isn't it poor taste to give Cally a lump of coal? Avon: It's a Sopron, you twit. I'm trying to fool her into thinking I got her a better gift than she got me. That's the last time I let Tarrant open the decorations cupboard. Vila: Oh, he's definitely lost it this time. Vila: I didn't know you were so embarrassed about that time when Blake said, 'I've always trusted you' just as you farted. Vila gripped the tinsel warily as Avon prepared to do his famous Christmas trick of firing at a lamp over his shoulder with his eyes closed. Avon: If you sing one more christmas carol Vila, I am going to have to shoot you. Vila: Oh come on Avon, give me hand putting up the chrissy decorations - we'll get it done much quicker. Avon: I am helping Vila. I am supervising. Blake: (over bracelet) Bad news. Zen says it'll take another two hours to clear all that tinsel out of the teleport circuits. Avon: Well, I hope you're satisfied. Vila: How was I supposed to know it wasn't teleport-safe?! Avon: Vila, it's almost nine. Blake's going to have a fit if the presents aren't wrapped before the party. Vila: You could help instead of just standing around. You have any idea how hard it is to gift-wrap moon disks? Avon: I've been busy putting red and green light bulbs in Zen and Orac, if you must know. Vila: Are you sure Blake wants musical socks Avon? Avon (into teleport bracelet): Yes me and Vila have got you all lovely christmas presents. Avon: Jenna we need teleport now. Vila's finaly decided on a colour of tinsle. Before he changes his mind. Vila: You know I'm not sure gold will go with Orac. Vila: How do you find these cheap christmas shops in deap space? Avon: Oh more easily than you think.